Stop me if you've seen this before. Male photographer ventures through a region with a camera, sometimes over the course of several months or years, in search of Americana. The American West is a common target. Or the South. Or the North. Or Appalachia. Or whatever, so long as it has a mix of salt-of-the-earth types willing to stare broodingly into middle distance, forested vistas, access to an airport, and a strong whiff of pathos. Maybe the photographer lives with the locals, or frequents their watering hole, or whatever it takes to develop access. 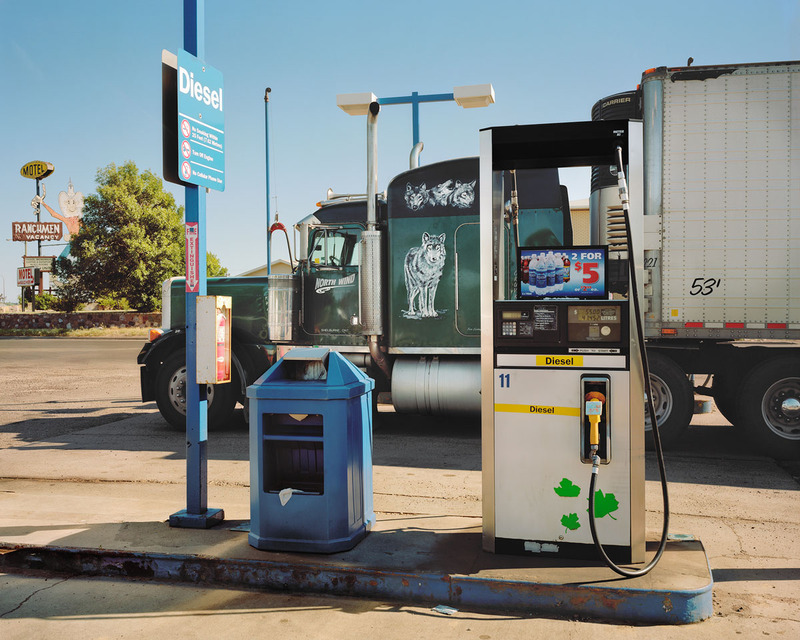 Photographer returns home with a carefully calibrated mix of landscapes, portraits, and interiors shot on color film. Usually the tool is a view camera, although a smaller body is allowed so long as it's a Mamiya 7. The inkjet results are printed nice and big, mounted in the squared white frame du jour, no matting, with slightly desaturated color palette to match, then sent off on the exhibition circuit, where they present a statement about the place. Or about America. Or a nostalgic nod to the industrial cycle. Or something. The landscape/interior/portrait combination is something of an unholy docutrinity in contemporary straight photography. It's the photo two-fer, a way of expressing inner ruminations under the guise of outer world documentation. The photographer takes on the role of scientific explorer. Go out, trap some images, report findings to the photo community in the prescribed mix. That it's a formula does not proscribe excellence. Some photographers excel. But I think it's important to call out the style. Just as almost any piece music recorded in 1969 is easily pegged to the date by the mix, vocal arrangement, and instruments of the era —the stuff not generally considered creative content, in other words— when we look back in 30 years at the present era, I think docutrinity will be the visual motif which announces "2015!" Of course docutrinity didn't begin in 2015. As with so many other current trends, I'm going to lay the blame on Sleeping By The Mississippi. No offense to Soth since I think the causal chain was spurred unwittingly. 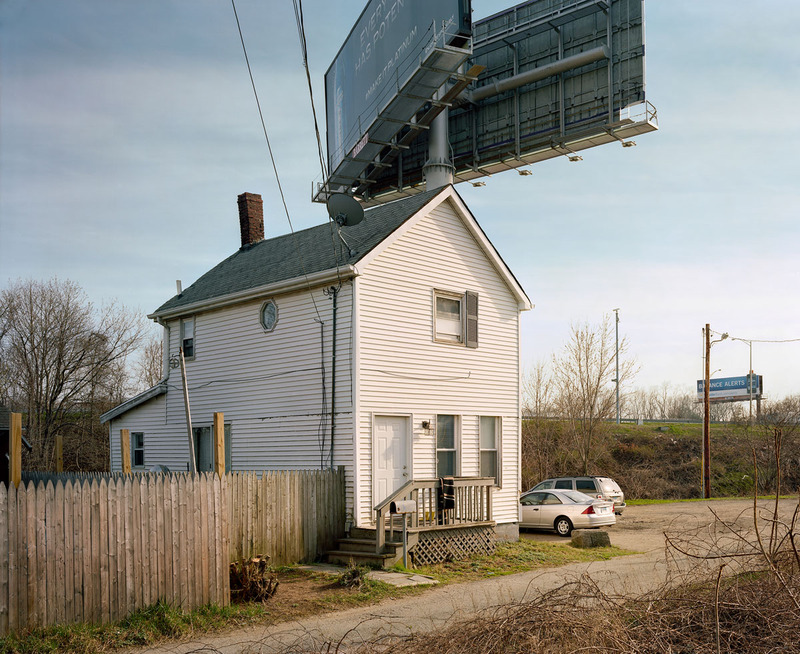 And maybe he would deflect it one generation back to Sternfeld's American Prospects, or two generations to Evans' American Photographs. But I hold Sleeping By The Mississippi mostly responsible. It was the Velvet Underground of photobooks. It only sold a few thousand copies but everyone who bought one initiated a similar photo project. Explore Americana —or is it the self? Mix cultural landscapes, portraits, and a few interiors, report findings. That's my natural bias coming through. I realize the docutrinity mix works for Sleeping By The Mississippi, and maybe it can work for other projects. But it's a very delicate mix, and tough to follow without it seeming formulaic. Newspace in Portland has established itself as a minor outlet for docutrinity, with shows in recent years by Daniel Shea, Jeff Rich, and Bryan Schutmaat, among others. 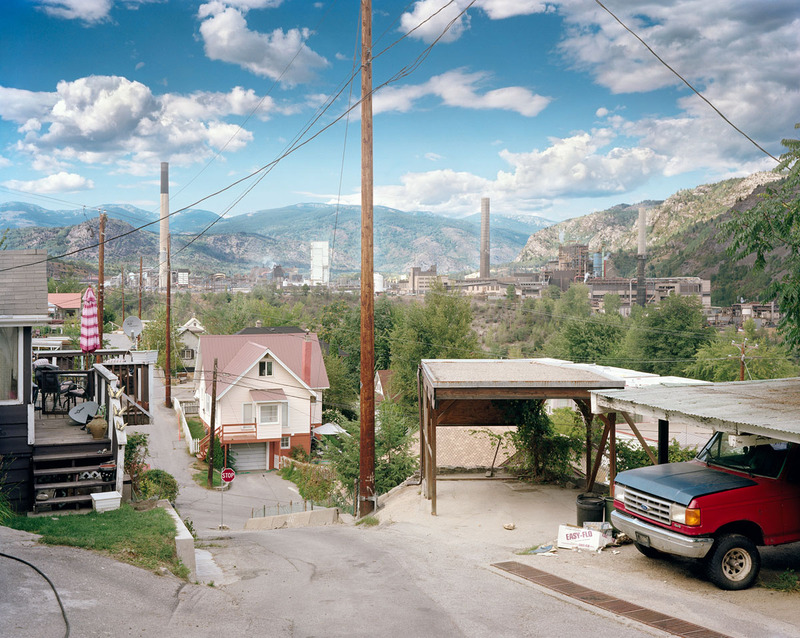 Ben Huff's current show The Last Road North is the latest example. 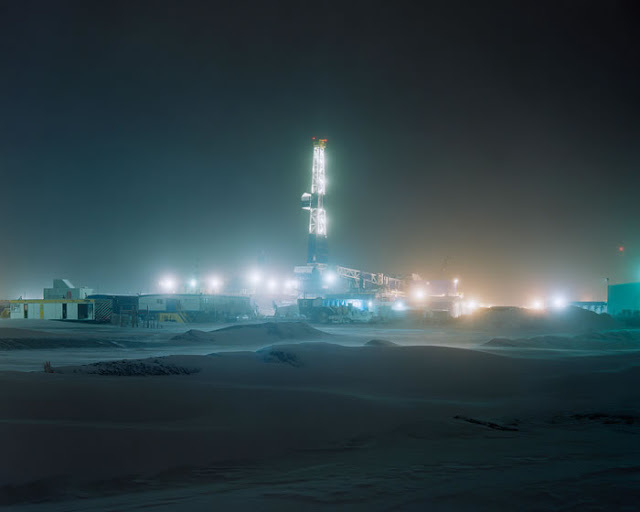 Huff spent five years photographing the 400 mile haul road connecting Alaska's northern interior to the Arctic Ocean. What did he find up there? About what you might expect. Beautiful scenery, desolate roads, snow, stragglers bearing flannel. The show at Newspace is entertaining and impressive, but I can't say it's very surprising. In Huff's defense, there isn't much cultural material up there to work with. But the onus is still on the photographer. Whatever is encountered, he or she must find a way to show something new, or in a new way. I'm not sure these do. The prints are large with plenty of room to pour over. The photos shift as you look at them, with new small discoveries releasing like time-release capsules. This one captured me initially with the bizarre spatial dynamics, not to mention the social commentary. Talk about a boxed in living situation. It was only as I looked for several minutes that I noticed the diaspora of small posts, sticks, windows, and vegetation, each one holding down part of the photo. It was a pleasure to view the full sized print on the wall at Blue Sky, even if the improved altered color palette leans toward the sanitized. The cultural landscapes are great, and the interiors are interesting. For me there's only one thing holding them back: the portraits. If only Gardiner had followed Shore to the end and eliminated them from the series. But for whatever reason Gardiner's gotten caught up in the docutrinity zeitgeist, to poor effect. The portraits are sluggish, with cinema lighting on subjects staring off-camera. I suppose the subjects are meant to look thoughtful but to me they look bored, and worse, scripted. Instead of natural elements in the scene, they seem like characters or add ons. That's fine if you're Lorca-DiCorcia or Crewdson expounding on a dreamworld. But I'd rather see reality, or at least the impression of it. There are some docutrinity interiors on display as well, including a nice trophy shot, but I'll let those slide for now. Because for me the portraits were the main distraction. I know what you're thinking. If a photographer can't combine landscapes, interiors, and portraits what can they shoot? Aren't those subjects the bread-n-butter of documentary tradition? Well, yes. Here's what I suggest instead. What if photographers focus their energy on finding tiny toy cars in the landscape? Not just the normal Matchbox ones, which are small, or the slightly smaller Lego cars. I'm talking about teeny teeny tiny automobiles barely large enough to see, on a scale with ants. With patience and a little luck you can find them anywhere, North, South, Appalachia, etc. Now, obviously they will be hard to photograph. But that's the point, right. Because very few people have photographed this world yet. It's wide open for anyone who wants to take a teeny tiny camera, get close enough to smell the tiny exhaust, and aim their tiny lens at all the teeny teeny teeny weeny tiny cars of every color. Present in a teeny tiny white frame, with teeny tiny engine drone soundtrack playing in the corner, and Bingo! You've created something new. Always love reading your posts, Blake. Thanks for making me aware of Thomas Gardiner, I hadn't heard of him before (and given his last name I probably should have.) Not so sure about his portraits but love his landscapes! Thank you for taking to task an elephant in the room, although I myself might be implicated here as well. The last paragraph made me laugh as much as your Peter Lik post.